April 14, 1909: Municipal Journal and Engineerarticle. Champaign Urbana Water Works. “Underground Supply-Wells Pumped by Steam, Electric and Belt-Driven Pumps-Iron Removal by Aeration-Most Services Metered. The Champaign and Urbana Water Company, of which Mr. F. C. Amsbury is superintendent, supplies two Illinois cities from which it gets its name. These have a total combined population of 23,000 or 24,000, and form practically one community. An underground source of supply is tapped by twelve eight-inch wells about 16o feet deep. Each of these wells has its own separate direct-acting pumping head. Both Downey and Luitwieler pumps are used, with long rods extending to valves at the bottom of the wells. A few of the pumps are single-acting, but most are double-acting. Four of the wells are located along one side of the main pumping station. The pumps in these are connected by belts, running in tunnels underneath the ground, to a main shaft, also in a tunnel, and this in turn is driven from the main engine. Three of the pumps are run by steam heads, the steam pipes being carried in tunnels and thoroughly jacketed. The other five pumps are operated by electric motors which receive their current from a generator in the main station. Reference: “Champaign Urbana Water Works.” 1909. Municipal Journal and Engineer. 26:15(April 14, 1909): 625. Commentary: I am not surprised that the method of aeration is only “fairly effective.” The author was probably being kind. It would take a few more decades before efficient aeration devices were created to oxidize ferrous iron in groundwaters. Note the “security” fence around the reservoir. This entry was posted in Year 7 TDIWH and tagged Champaign Urbana, drinking water, groundwater, iron removal, public health, reservoir, water, water history on April 14, 2019 by safedrinkingwaterdotcom. April 14, 1909: Municipal Journal and Engineer article. Champaign Urbana Water Works. “Underground Supply-Wells Pumped by Steam, Electric and Belt-Driven Pumps-Iron Removal by Aeration-Most Services Metered. The Champaign and Urbana Water Company, of which Mr. F. C. Amsbury is superintendent, supplies two Illinois cities from which it gets its name. These have a total combined population of 23,000 or 24,000, and form practically one community. An underground source of supply is tapped by twelve eight-inch wells about 16o feet deep. Each of these wells has its own separate direct-acting pumping head. Both Downey and Luitwieler pumps are used, with long rods extending to valves at the bottom of the wells. A few of the pumps are single-acting, but most are double-acting. This entry was posted in Year 6 TDIWH and tagged Champaign Urbana, drinking water, groundwater, iron removal, public health, reservoir, water, water history on April 14, 2018 by safedrinkingwaterdotcom. This entry was posted in Year 5 TDIWH and tagged Champaign Urbana, drinking water, groundwater, iron removal, public health, reservoir, water, water history on April 14, 2017 by safedrinkingwaterdotcom. This entry was posted in Year 4 TDIWH and tagged Champaign Urbana, drinking water, groundwater, iron removal, public health, reservoir, water, water history on April 14, 2016 by safedrinkingwaterdotcom. This entry was posted in Year 3 TDIWH and tagged Champaign Urbana, drinking water, groundwater, iron removal, public health, reservoir, water, water history on April 14, 2015 by safedrinkingwaterdotcom. This entry was posted in Year 2 This Day in Water History and tagged Champaign Urbana, drinking water, groundwater, iron removal, public health, reservoir, water, water history on April 13, 2014 by safedrinkingwaterdotcom. Commentary: I am not surprised that the method of aeration is only “fairly effective.” The author was probably being kind. It would take a few more decades before efficient aeration devices were created to oxidize ferrous iron in groundwaters. 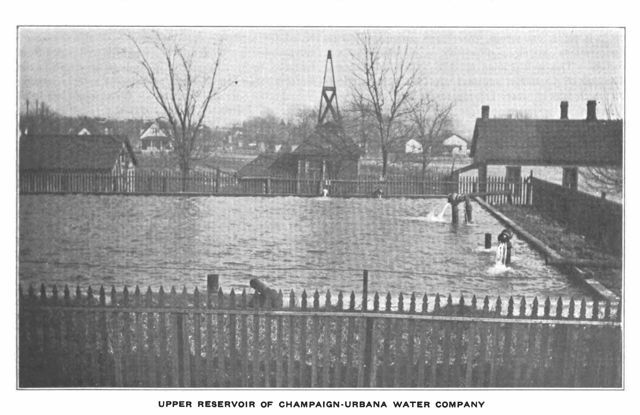 This entry was posted in This Day in Water History and tagged Champaign Urbana, drinking water, groundwater, iron removal, public health, reservoir, water, water history on April 14, 2013 by safedrinkingwaterdotcom.